The Grizzlies where one of two Canadian NBA Franchises that played their first season in 1995 in Vancouver, until their eventual move to Memphis in 2001. The team never made the NBA playoffs and were consistently one of the leagues worst teams during all of their 6 seasons in Vancouver playing out of the Mid-West Division and never winning more than 23 games in a season, which they accomplished their final year. Below is their year by year history with coaching history, straight from basketball-reference.com a great source for NBA information that I will use throughout this page and invite you to visit. The team played 460 Games as the Vancouver Grizzlies and left with a record of 101 Wins, 359 Losses, good enough or bad enough depending on which way you look at it for a .220 winning percentage. The only time they didn’t finish last in the Mid-West division was in 1997-98 when they placed ahead of a terrible Denver Nuggets squad. The team has been a lot more successful since the move to Memphis, but this site will focus on their time as a Canadian franchise, a time when fans wore Bryant “Big Country” Reeves jerseys to General Motors Place in Vancouver. The first played ever draft by the Vancouver Grizzlies, a 7 foot Center out of Oklahoma State drafted 6th overall at the Skydome in Toronto and just ahead of the Raptors 7th overall pick of Damon “Mighty Mouse” Stoudamire. The Grizzlies second round pick that year 36th overall was Lawrence Moten a 6-foot-5 Shooting guard out of Syracuse. Both Reeves and Moten never played in the NBA for anybody other than the Vancouver Grizzlies. Picture from the Vancouver Sun of Shareef Abdur-Rahim, Bryant ‘Big Country’ Reeves and Mike Bibby. 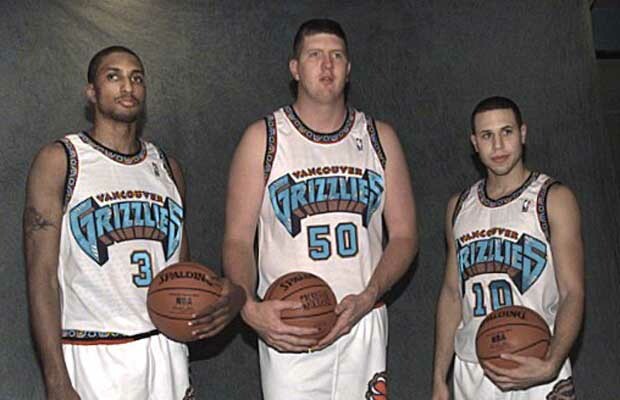 These three were the Grizzlies star players during their time in Vancouver. 1995-96 Player Salaries: Gerald Wilkins$2,478,000, Eric Murdock$2,000,000, Blue Edwards$1,900,000, Greg Anthony$1,673,000, Byron Scott$1,650,000, Bryant Reeves$1,474,000, Kenny Gattison$1,450,000, Eric Mobley$1,328,000, Doug Edwards$1,040,000, Anthony Avent$950,000, Darrick Martin$425,000, Antonio Harvey$400,000, Lawrence Moten$280,000, Ashraf Amaya$225,000, and Chris King$225,000.